Growing up in South Africa meant I was spoilt for choice with lots of beautiful and naturally ripened fruit most year round. I have many a fond memory of running around my grandparent’s back garden with my brother in tow picking fruit from the trees and stuffing ourselves until we felt completely sick, life was good :-). Passionfruit is one of my Mum’s favourite fruit and I can honestly say that it never made my top five when I lived in SA. I was much more of a fig, mango, papaya, pineapple and peach kinda girl. It does however seem like my palate has somewhat matured over the years as I have now become rather fond of this strange, but rather intricate looking fruit. I couldn’t help but giggle the first time I offered these to the kids as they simply freaked out and left the table as if they were offered an alien tea from planet zum zee. Fortunately these little balls of magic offer vitamin A, vitamin C and good levels of fibre, so ideal to use in a smoothie or just enjoy on its own. 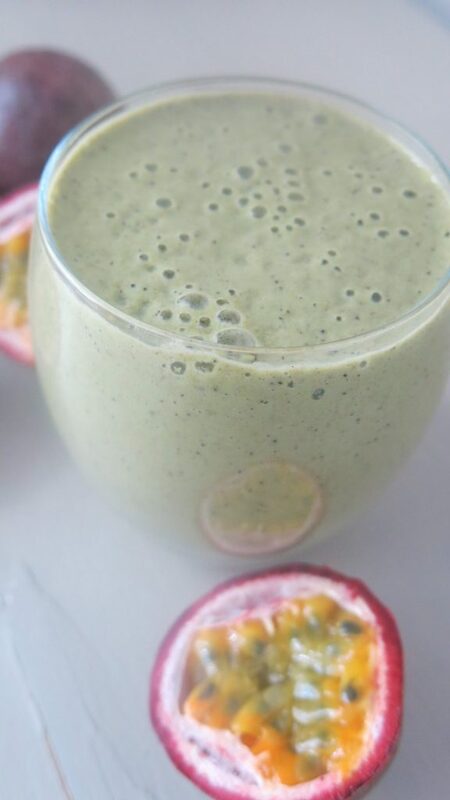 This recipe makes just one glass, so perfect to enjoy during the day as a pick me up or alternatively you can enjoy it alongside some good quality protein like egg and spinach for breakfast. I love the combination of banana and passionfruit, but what I love even more is adding green tea. If you have never used green tea powder, now is the time to start. I am sure many of you have heard just how amazing green tea is for your health, so let me tell you why. Basically green tea like other teas contain something called catechins, which is a type of flavonoid. Flavonoids are polyphenolic molecules that give fruit, vegetables and herbs their vibrant colour. As a phytonutrient they also act as an anti-oxidant, anti-allergen, anti-cancer agent, anti-inflammatory and are anti-viral, so what is there not to like about them?! I know that many people don’t feel the love when it comes to green tea and if you are one of these people, don’t fret as the flavour of the powder is far from overpowering. It has subtle tones that blends in well with these flavour combinations. My favourite brand is Clearspring Japanese Organic Matcha Green Tea Powder, which you can buy here. If this is still too much for you then you can consider other EGCG rich foods like apples, blackberries, cherries, cacao and black grapes. We can always rely on nature to give us various options to provide our bodies with the best possible nutrients. Put your chia seeds in the blender and blend to a fine powder. Add all your other ingredients and blend on a high-speed until smooth. Pop in a glass and enjoy. You can also add other superfood powders, like a super greens powder or Minvita Moringa Superfood Powder. 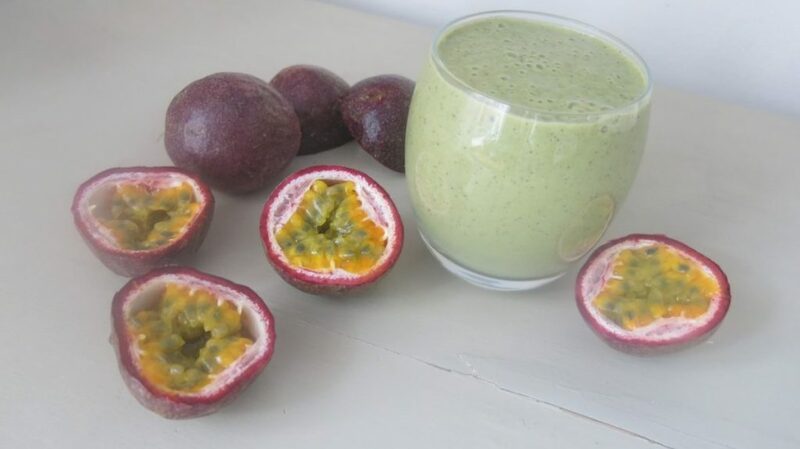 Add another passionfruit for a really zingy passionfruit experience. If you haven't got a frozen banana handy, then simply add around 4 ice cubes just to make your smoothie super refreshing. Nutritional Information per 250ml serving. 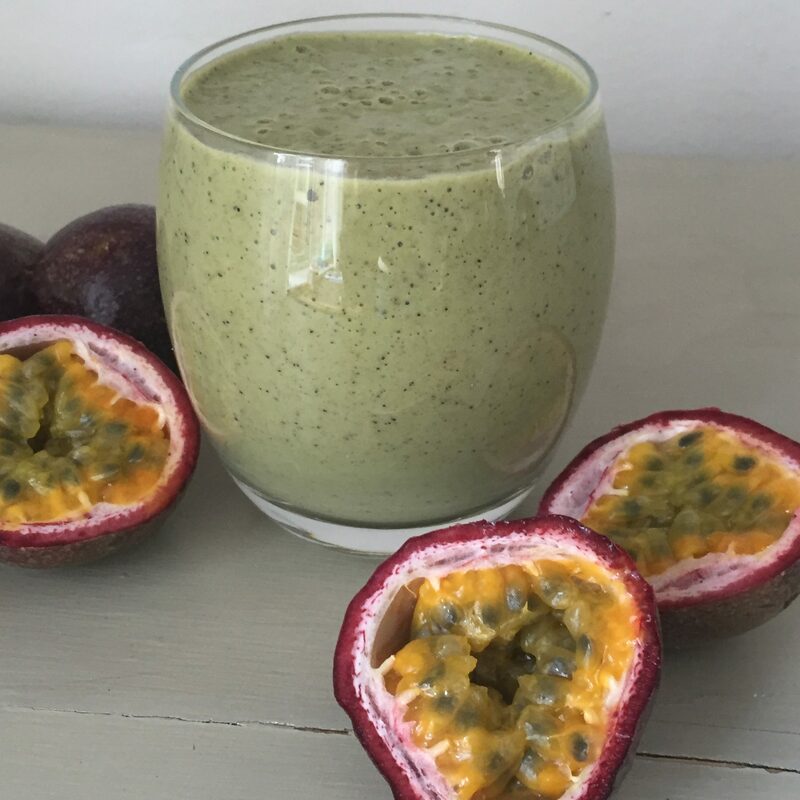 Calories 216Kcal; Protein 6.6 g; Carbohydrates 37.6 g; Fat 6.6 g; Fibre 9.2 g.
I hope you enjoy this smoothie as much as I do and I would love to hear your feedback so please leave me a comment. Also, if you subscribed in the past, I would appreciate it if you could do so again as we had a few teething problems, which have now been resolved. So in order to ensure that you get my next recipe straight to your inbox, just go to the Subscribe box on the top right hand side of my blog. 1. Ide, K, et al. (2015). ‘Effects of green tea consumption on cognitive dysfunction in an elderly population: a randomized placebo- controlled study’. Available at: http://www.ncbi.nlm.nih.gov/pmc/articles/PMC4855797/pdf/12937_2016_Article_168.pdf. 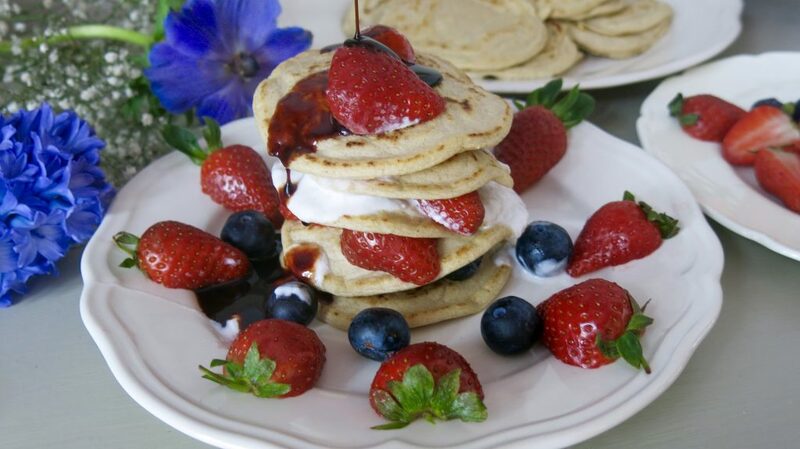 The Best American Style Pancakes You Have Ever Eaten!